Bring some lovely warm orange tones to your homes décor with our high quality made to measure orange blackout roller blinds. 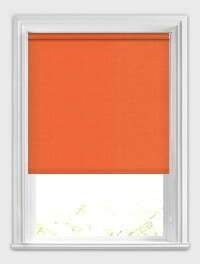 They are a great way to bring that sunny feeling to your windows whilst giving you added control over sunlight and privacy. I would recommend English Blinds. The blind I ordered is excellent, exactly the size I ordered and was easy to fit. Good quality, easy to keep clean. Excellent product, very pleased with the roller blinds. I ordered three made to measure blinds for my kitchen. The material and fittings are good quality. Will use this company again. The blind arrived as stated, is up and fits well. Thank you so much. Excellent quality, professionally made and delivered. Very satisfied with the finished product in situ.